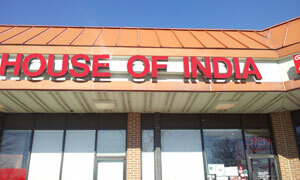 House of India is an Indian restaurant located in Columbia, Maryland. House of India offers a casual dinning atmosphere for its patrons. Since its opening in the year 2001, House of India has grown to be a popular neighbourhood gathering place for local business and residential communities. House of India serves authentic Indian cuisine and offers a wide selection of vegetable, chicken, lamb, goat and seafood entrees and appetizers. All of the entrees are accompanied with basmati rice. House of India offers freshly baked breads made from our clay tandoor and also offers a fine selection of Indian desserts. House of India's chef, Shyam Prakash, has over 30 years of experience in Indian Cuisine. During his 30 years as a chef, he has cooked in various restaurants; Indian restaurants located in India as well as Europe and in the US. Chef Shyam Prakash has even had the privilege of cooking spicy lamb vindaloo to former President Bill Clinton!